Back to School, EarthBound Style! You can see the reddit post here, too. 23 Comments to Back to School, EarthBound Style! That is so cool I would so totally go back to school if I saw that in my local stores. I’ve been in denial about back to school for a while now, but this actually would make me excited for school; If, you know, they sold these in my local grocery stores. That is now the most awesomest grocery store in the world. 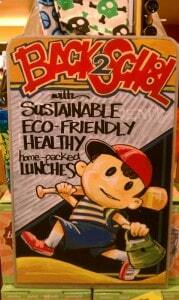 Sadly, most kids today would only recognize Ness from Smash Bros. But when I have kids I’m not buying their peanut butter and jelly sandwiches from Whole Foods. Based on how much money Ness’s dad was depositing into his account, I bet his mom got *insert favorite food here* from Whole Foods. Sweet, someone who works there drew that? That’s based off this image. It could be an EarthBound fan that drew that, but it could just as likely by a Melee fan, or even just someone who found the image for some reason and decided it would be good to use as an advertisement. I saw this on Reddit too. Well, I guess recycling food from a trash can could be considered eco-friendly! I think Luca would be a better fit (since the food he eats can be considered eco-friendly: Nut Cookies, Nut Bread…), but Ness has that “schoolboy look” with him. I can just imagine a group of kids seeing this, and one of them would say “Hey look! It’s Ness!” and the other kids would be like “Huh?”. Anyways, this is pretty cool. I wonder if we have a secret EarthBound fan amongst that market? OMG i want that lunchbox! @nnnnnnnnnnnnneeeeeeeeessssssss I’LL FIGHT FOR IT!